C.M.Watson, a Ballarat lawyer, was the father of the future Australian champion (C.G.M.Watson, champion in 1922 and 1931). A.G.M’Combe played an important part in the early history of chess in Victoria. A former secretary of the Glasgow Chess Club, he triggered off the surge in chess activity in 1855/56 in Melbourne which led to the very first tournament in Victoria (Melbourne 1856). After playing in the Ballarat tournament in 1867 he returned to Melbourne where he became editor of the Australasian chess column from 1867 until his retirement (in disgrace) in 1870. Charles Marshall Fisher (1845-Apr.1890) was born in Creswick, and educated at Brighton. After leaving school he spent some time in Ballarat, where he acquired so great a reputation as a chess-player that he was chosen as a representative of Victoria in several inter-colonial matches with New South Wales. Fisher was president of the Ballarat Chess Club 1867-? And one of the Vice-Presidents of the newly formed Victorian Chess Association in Sept.1877. Later in life he resided for some years in Sydney, and was engaged there as a stock and sharebroker. He also occupied the position of chess editor of the Sydney Mail (1878-’79), and became known as a good player of blindfold chess. In the year 1871 he returned to Melbourne, where he had a successful career as a sharebroker, and was understood to have realised a fortune in Broken Hill stock. He went to England about a year ago with his wife and daughters, and when last heard of he had gone to Nice, presumably in search of warm weather. Mr. C. M. Fisher succeeded the late John Wisker as chess editor of The Australasian (1884-’85), and occupied that position with great credit to himself for several years. As a chess editor he was always distinguished by his perfect fairness, by his uniform courtesy, by his mastery as a judge of the merits of problem composition, and by his skill as an annotator of games. As a chess-player his most brilliant and most famous achievement was his defeat of Mr. Louis Goldsmith at a time when that accomplished player was at the zenith of his chess strength. The match, which was for the first five wins, partook of an inter-colonial character, being played during the years when Mr. Fisher was a resident in Sydney. 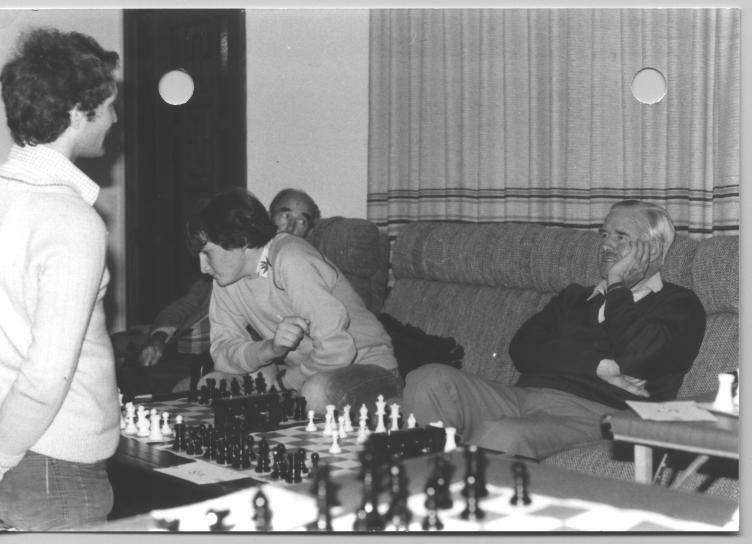 The score at one stage was in Mr. Goldsmith's favour by four wins to two wins, but Mr. Fisher then showed his quality as a match-player by scoring the next three games in succession, thus winning the most interesting chess match that has yet been played in Australia. After his return to Melbourne, he maintained his reputation as a match-player by twice carrying off the chief prize in handicap tourneys of the Melbourne Chess Club; Mr. Burns, Mr. Gossip, and other good players being among his competitors. As an odds-giver he was probably without a rival in Australia. Of late years, however, his business engagements have been too engrossing to allow of his devoting much time to chess and he has been content to be recognised in Melbourne chess circles as one who had won his spurs as a member of the "old brigade." But it is known that during his holiday trip in Europe he had carried out the intention, of which he had often spoken to his Melbourne chess friends of testing his quality as a player in some of the most famous of the chess resorts of Europe; and ‘The Australasian’ of December 28 contains the score of a brilliant skirmish which he had won a few weeks previously at the Cafe de la Régence, in Paris. This is the last specimen of his chess skill which has been published in Melbourne. By 1875 there was little doubt that the 3 strongest players in Australia were Andrew Burns, Louis Goldsmith, and Charles Fisher. In that year Goldsmith and Fisher played, for a stake of £20 a side, the first notable match over the board between a Victorian and a player from another colony. The match, played in Melbourne club, drew many spectators and was narrowly won by Fisher. When Blackburne visited Australia in 1885, Fisher alone held the British master to a draw on level terms. Fisher returned to Ballarat in 1884 to give a demonstration of simultaneous play and an uproar was caused when an official of the Institute turned the gas out on him. It was reported in the Ballarat Courier (21st March 1884)* and reprinted in Fisher’s column in the Australasian, the following week. DEATH OF MR. C. M. FISHER. It is with deep sorrow that we announce the premature death of this distinguished player which, we learn by telegram, took place at Monte Carlo on the 29th April, at the early ago of 45. Mr. Fisher was a native of Victoria, having been born in the Goulburn, where his father had a station called Woodstock. While he was still a child his father removed to St. Kilda, and he was sent for his education to a school at Brighton. The family afterwards changed their residence, first to Geelong, and then to Ballarat, where at the age of 15 he entered the office of the local foundry, in which he remained for the next 10 years. When a very young man he devoted himself to the study of chess, in which he became an adept, and ever since has been identified with the progress of the game in Australia. In 1866, he won the championship of Ballarat in a tournament, in which, we believe, both Mr. M'Combe, the well known player, and Mr. Connor took part. His first appearances in Melbourne were at the Intercolonial matches of 1870 and 1871 against New South Wales. His opponents on these occasions were Messrs. Pendrill and Haydon, respectively, but he only succeeded in drawing both games. Indeed, in most of the Intercolonial Matches, as will be seen hereafter, he was unfortunate, and seemed not to play up to his full strength. In 1872 business called him to Sydney, and in that year we find him in the New South Wales team pitted against Mr. S. Phillips, who at that time was one of the finest players in Victoria, and from whom he suffered defeat. 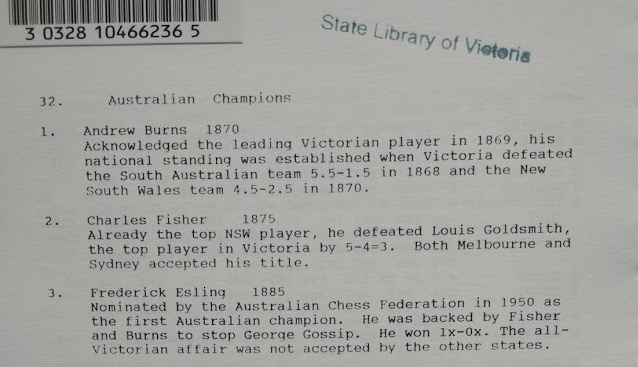 He soon , however, established his title to the championship of New South Wales by winning a challenge cup, presented by the president of the Sydney Chess club, twice in succession. In the second tournament for this cup which took place in 1873, he lost both his games with Mr. Robert Smith, which gave rise to a challenge from that gentleman to a match. This came off towards the end of the same year, and after a hard struggle in which the score at one time stood at 5 all, resulted in favour of Mr. Fisher, the final score being Fisher 7, Smith 5. In the Intercolonial matches of 1873 and 1874 he again appeared in the New South Wales team, his opponent on both occasions being Mr. Stephen, and won both games. Early in the following year, 1875, he paid a long visit to Melbourne, during which a match was arranged between him and Mr. L. Goldsmith, to be decided by the winning of 5 game. This match proved to be the closest and most exciting that has occurred in Australia. At one time it seemed as if Mr. Goldsmith was to have a somewhat easy victory, the score standing at Goldsmith 4, Fisher 2, but the latter proved himself equal to the occasion, and though six more games were played before the match was decided, he did not allow his opponent to win another game, the final score being, Fisher 5, Goldsmith 4, drawn 3. In the Intercolonial match of the following year he was drawn against Mr. Burns, the result being one of the finest games ever played in Australia, which was scored by Mr. Burns. In the same year he again came out first in the handicap tourney at the Sydney Club, Mr. Crane being second. In consequence of his repeated victories he was very heavily handicapped in the tourney of 1877, having to give Mr. Crane the odds of pawn and move. Notwithstanding this he won both his games with that player, and once more carried off the first prize. Strange to say, though he must at the time have been in excellent form, he suffered a third defeat in the Intercolonial match of the same year, his opponent on that occasion being Mr. Stanley. After this he appears to have relaxed his efforts somewhat, as we find him in the Sydney handicap of 1878 taking only third place, Mr. Ryan, to whom he gave the pawn and move, being first, and Mr. Slade second. In this tourney, however, he was again successful against Mr. Crane at the same odds. The result of the handicap of the following year shows that he must have been quite out of form, as he was not even placed, Mr. Crane who received the pawn and move, taking first honors. This surmise is confirmed by the fact that he declined to play in the Intercolonial match of May 1880, evidently feeling that he could not do himself justice. Shortly afterwards he returned to Victoria, and in the Intercolonial match of 1883 again took his place in the Melbourne team, his opponent being Mr. Crane, with whom he drew. For some time after his return he took little part in chess matters, being absorbed in mining speculations, but in 1884, having been appointed chess editor to a weekly contemporary, he returned to chess circles, and resumed practice of the game. In this year he entered as a competitor for tho challenge in a tourney at the Melbourne Chess Club, but was unsuccessful, having been defeated by both Mr. Burns and Mr. Gossip. In the following year, however, he retrieved his laurels, and carried off the cup, following up this success by winning it a second time in 1886, when it became his absolute property. By these victories he established his claim to the championship of Victoria. Since that time, being engaged in large speculations in silver in the Stock Exchange, in which he was very successful, he almost entirely withdrew from the chess arena, and took no part in either of the Intercolonial champion matches, subsequently held in Adelaide and Melbourne. Besides being a fine player over the board, Mr. Fisher could play very well blindfold, though he never, we believe, attempted the feat, now somewhat common, of conducting several games simultaneously. He was also an excellent judge of problems, which he occasionally composed himself. As a chess editor, he was distinguished by invariable courtesy and keen powers of analysis. At the beginning of last year he determined to pay a visit to England, which he had never seen, and sailed with his wife and family in the month of March. On his arrival, he found his way to the chess clubs of London and Paris, and met with considerable success in his encounters with the amateurs whom he met, though we are not aware that he crossed swords with any of the recognised champions. To escape the rigors of an English winter he went to the south of France, and up to the date of his last letters appeared to be in good health and spirits, talking of an early return to Victoria. The telegram announcing his death has therefore come with a painful shock to his relatives and friends, who were looking forward to an early happy reunion. In private life Mr. Fisher was a pleasant and lively companion, and his cheery presence will be much missed at the club room as well as by a large circle of friends. But to his own family, his loss is irreparable. In all his domestic relations he was most exemplary-a good and generous son to his aged parents, who are both alive; a kind brother and an affectionate husband and father. He leaves a widow and two young daughters to mourn his untimely death. THE LATE C. H. FISHER. A private letter has been placed at our disposal from which we have compiled the following account of the closing months of Mr. C. M. Fisher's life:-He went to Paris at the end of last October, and remained there for about five weeks, during the whole of which he was in the best of health. At the beginning of December he visited Fryeburg, for the purpose of inspecting the mining machinery of the place. From Freiburg he went to Berlin, where he found the cold so intense that he proceeded to Vienna with the intention of returning to Paris southward. But when he reached Vienna the place was blocked with snow, and the train by which he travelled was the last to arrive. For four days nothing could leave the town. He therefore decided to change his route, and to return to Paris as speedily as possible. He arrived there suffering from a frightful cold and from bronchitis, and found his wife and children prostrate with the prevailing epidemic of influenza. As soon as they were able to travel they proceeded to Nice, where for the first three or four weeks Mr. Fisher's health was splendid. He then began to complain of sleepiness and of headache. After a little while he was persuaded to consult an English physician, who pronounced the pain in the head to be neuralgic (?BvR), prescribed generous food, with as much open-air life as possible, and directed that Mr. Fisher should not be allowed to give way to his tendency to go to sleep. As, however, he still continued to complain of pain in his head, he was recommended to go to Monte Carlo. He had been there only a week when he was suddenly prostrated by an attack which a German doctor, who was staying at the hotel, pronounced to be paralysis of the left side, accompanied by slight haemorrhage on the brain. The attack had been induced by the incorrect treatment which had followed on the earlier warning symptoms of sleepiness and pain in the head. After a short time an English doctor was called in, and under his care Mr. Fisher's health speedily began to improve. In the course of a little while he was able to discuss business matters with his wife. He was wonderfully well on Tuesday, April 22. and went out for a short drive, during which he caught a slight cold. Three days afterwards he seemed so much better that the doctor told him he might look forward to being taken to Aix les Baines in about a week. A few hours later, at midnight, Mrs. Fisher thought that he moved in his sleep, and on going to him she found him unconscious, and perspiring profusely. The doctor, who lived close by, was promptly in attendance, and saw at once that there was a fresh haemorrhage. Other medical men were called in consultation, and everything that was possible was done to save Mr. Fisher's life. On the morning of Sunday, April 27, he seemed much better, and it was thought that there was a chance of his living. But in the evening he was worse, and on the following morning it was evident that the end was near at hand. He lingered, however, for about 24 hours, and died early on the morning of Tuesday, April 29. Mrs. Fisher was desirous of arranging for the transport of the body to Melbourne, so that it might rest in the St Kilda Cemetery. But the difficulties in the way were so great that she was compelled to abandon the idea, and to consent that the body should be laid in the pretty little cemetery of Monaco. Mr. Fisher’s will was proved a few weeks ago at £46,910. Hence, says the "Adelaide Observer," the deceased chess-player may not inappropriately be called the Kolisch of Australia. " Fisher and Kolisch were nearly the same age, the latter being the elder of the two, and both died in Europe, Kolisch near Vienna on April 29, 1889, and Fisher on exactly the same day of the same month a year afterwards at Monte Carlo. Both were brilliant chess players, genial disposition and popular with their fellows. Both retired from the chess arena, and concentrating their intellects upon business, speedily made a fortune, yet each never ceased to cherish a strong regard for the game, and liberally supported all projects for its advancement. Kolisch, by winning the Emperor’s prize in Paris in 1867, became the champion of the world, and Fisher at one time was probably the best player in Australia." **NB Ignaz Kolisch (later Baron) was born at Pressburg in the year 1837 and was regarded by Steinitz and others as one of the strongest players of the world. He challenged Morphy in 1867 for the world title but Morphy declined saying that he regarded Anderson and Paulsen to be stronger than K.
John was a Treasurer of the club for many years and we also have named the Reserve Championship after him. John played in numerous of the early Begonia events and visited the event each year after he could not play any longer. Ernest "Ernie" Greenhalgh was a past president of the club. More information is required on his contributions and history with the club - please contact the webmaster. Here is the 2010 Reserve Champion, Boris Skontra, receiving his medal from Patrick Cook. He played in the inaugural championship 50 years ago! His son, Vojka was Michael Schreenan's carer for many years before tragically passing away several years ago. Gary is a past Treasurer and member, one of the many important people who have kept the club going for its members and the Ballarat community. Gary Bennewitz at the 2009 Ballarat Begonia. Kevin is the current Treasurer and a life member of the club. The article below was written by Patrick Cook in 2007, and includes a game link to one of their games. Kevin Perrin, senior partner at Prowse, Perrin and Twomey, is a successful and respected accountant in the Ballarat community. Mr.Perrin was born in Ballarat in 1949 and received his secondary education at St. Paul's Technical College, leaving at the end of year 10. He completed year 11 at SMB and later qualified as a Certified Practising Accountant. However, like many other successful people, he has another string to his bow: he is a highly regarded and equally successful chess player. He learned the moves of the Royal Game from his brother at age 11 and joined the newly revived Ballarat chess club in 1966, just in time to compete in the first Ballarat Chess Club championship of the modern era. This was to be the first of an astonishing 42 successive championship tournaments as of this year (2007). "I just keep coming back because I enjoy it so much" he said. Of those 42 tournaments, Kevin has won seven championship titles, the chess club record, despite his last victory being way back in 1989! He is still a highly dangerous opponent, regularly finishing in the top two or three places in the Ballarat Championship. Reflecting upon the highlights of his chess playing career, he mentioned playing (and losing to) the doyen of Australian chess, the late C.J.S.Purdy, at the Geelong Open chess tournament in the early 1970's, and representing Ballarat Chess Club in a simultaneous exhibition at the Hiatt-on-Collins hotel against the former World Chess champion Boris Spassky when he visited Melbourne in 1989. When asked about his best played games, Kevin felt that two victories, over Bas van Riel and Patrick Cook, both six times Ballarat champions, were probably his best games in the Ballarat championships. "Those two games were technically very difficult", he said. He also recalls a beautiful smothered checkmate, a rare manoeuvre in chess, against the late Paul Saver at the Country Victorian chess championships, an event he has also won seven times. "Such rare moves provide a lot of the pleasure in chess." Kevin's achievements and contributions to chess extend beyond his prowess as a player, though. His major contribution has been in his capacity as an administrator. He became an office-bearer of the Ballarat Chess Club for the first time in 1967 when he was elected to the position of assistant secretary. Within two years he was elected secretary and served the club in that role for 27 years! Also in 1967 he was appointed assistant Director-of-Play for the lst Begonia Open Chess Tournament and has remained a pivotal organizer of this tournament ever since. The annual event has grown under his stewardship into one of the most prestigious chess tournaments on the Australian circuit, attracting the cream of the nations chess players over the past 41 years. The tournament trophy, the K.J.Perrin shield, is appropriately named after him. 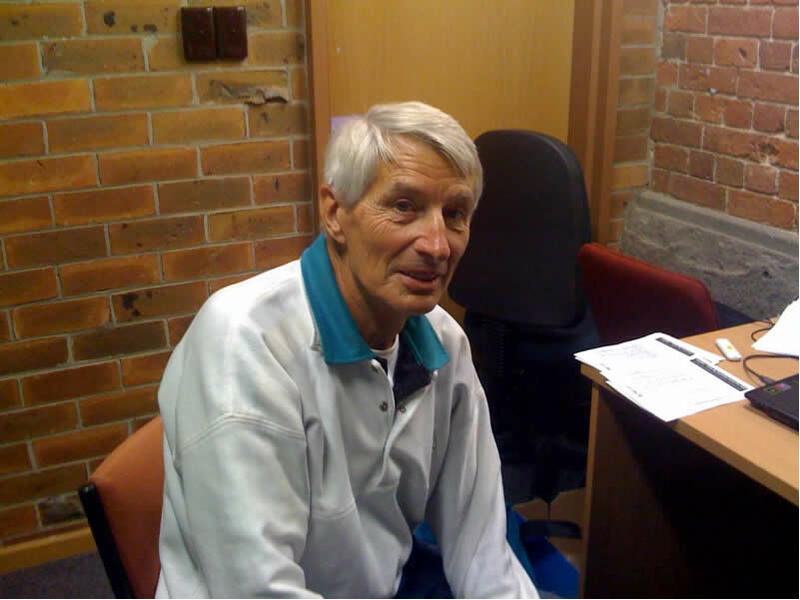 In 1981, Kevin initiated the School Chess competition for the Ballarat region and was a driving force in the running of the competition for well over 15 years. "Juniors are important; they're the future of the Club" he said. 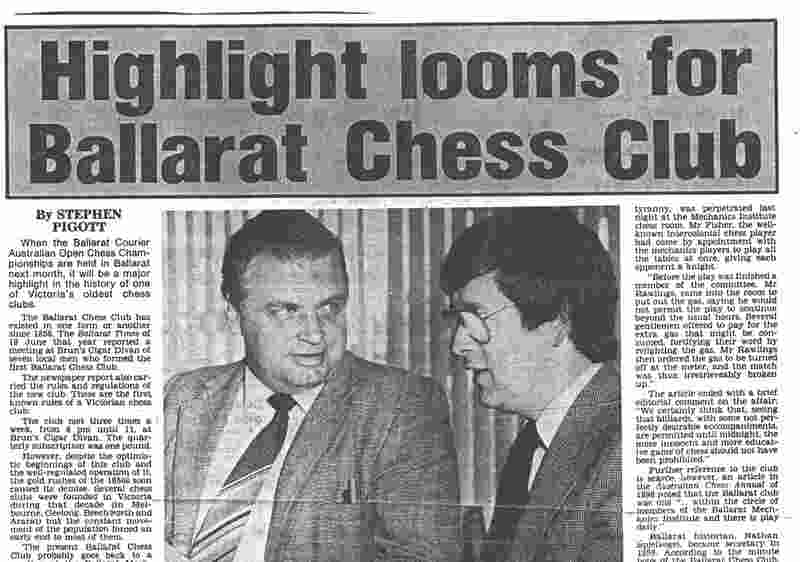 In 1984, he was one of the main organizers and Director-of-Play for the Australian Open chess championship when it was held in Ballarat, one of the rare occasions that this major event has been held outsid e capital city. The following year he was awarded the title of International Arbiter by the World Chess Federation (FIDE). Championships held in Adelaide. This annual event was unusually strong that year, with many future stars of world chess competing. 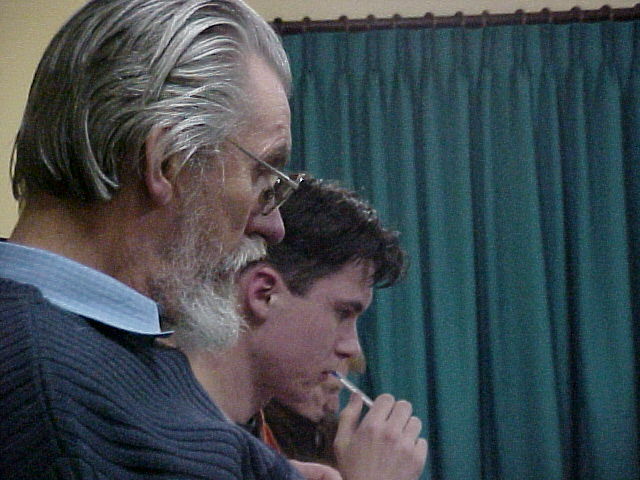 The following year the members of Ballarat Chess Club made him a Life Member, only the second player to be so honoured. 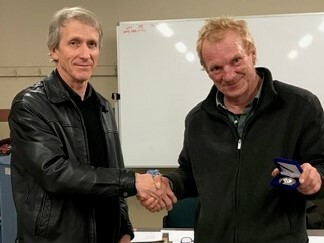 To crown this stellar administrative career, in 2002, the Australian Chess Federation recognized Kevin's outstanding contributions to Australian chess by awarding him the Koshnitsky Medal. When asked how he felt when looking back on his administrative career, Kevin observed "I suppose the awards and recognition are fine, but it isn't why we do it, as you know! We like to play competitive chess against strong opposition and you need a wellorganized chess club for that." 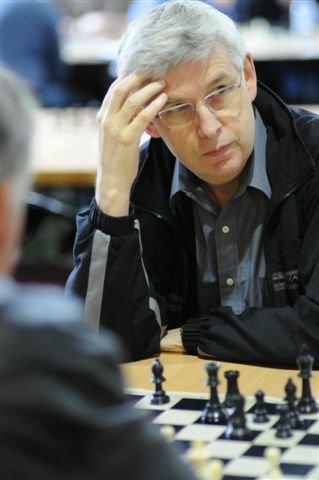 In recent years, Kevin has been stepping into the background as a chess organizer and administrator, but still serves his local chess club as a very competent Treasurer and, of course, as a keen and strong player, an inspiration to new and younger members of the chess club, and a fine example of the quiet and understated contribution many people make to their community by pursuing what they love. The following game well illustrates Kevin's strengths as a player: persistence combined with highly refined technique. 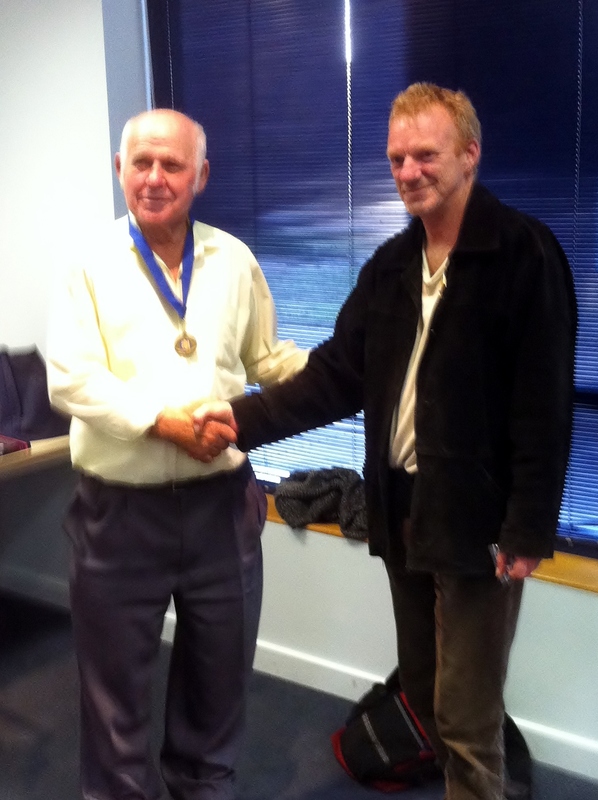 Rod receives his Life Member medal from President Patrick Cook. Rod first attended the club in the mid 1960's. Our club minute book records that his father attended a General Meeting of members held at the home of our first Life Member Andy Miitel on 1 October 1964. This was when the club was reformed after being in recess since 1962. Rod recalls that he did attend the club around that time along with his father in those early years, albeit that he was very young. The minutes for the 1980 AGM on 10/4/1980 show that Rod attended that meeting and was appointed as Publicity Officer. Rod was elected Treasurer of the club at the AGM held on 9/4/1981 and retained that position until 25/4/1991. On 5/4/1984 Rod was elected as convener of the committee to conduct the 1984/85 Australian Open Championship which was to be hosted by the club in Ballarat. He was instrumental in obtaining The Ballarat Courier as the major sponsor ensuring the financial viability of the championship. Rod's guiding influence during this time was a large part in the successful staging of this national event in Ballarat. 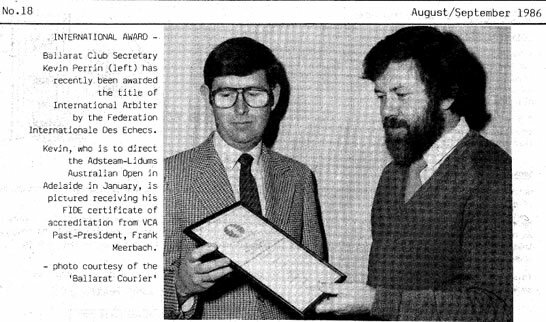 Appointed as Coordinator of Junior Chess Coaching in Ballarat On 5/4/1984. Rod served in this capacity for a period during the 1990's. Rod was a regular and active member of club up to 1994 when he took a break to progress his legal career. The records indicate that Rod attended a club EGM on 12/5/2010 and he has been a regular member ever since that time. Rod achieved on hid lifetime goals when he became Club champion in 2014. He won the title as 6' seed after a record breaking 4-way tie for first was resolved in his favour. Rod was appointed club captain in 2016 and he has represented the club at all 8 inter-city matches against Geelong. Married to Pam and with 2 children Mark and Linda who have both played at the club over the years. Proud grandparent of popular junior member Sasha who has been a regular player ever since his grandfather brought him along to the club. Rod was employed by the old law firm of Cuthbert Morrow Must and Shaw after he left Ballarat Grammar School and ultimately progressed to become a partner in that firm, which has more recently known as Cuthberts. After being a partner there for many years in 2010 Rod left that firm to commence his own professional practice along with his wife Pam. That has developed into one of the most well-respected legal firms in Ballarat. Rod has always prepared very well for his chess games and as we all know he has a quite aggressive and open attacking style. There are never any dull boring games when you play Rod. His post-game analysis and insightful comments can be seen on the club website. He plays chess just the way it should be hard and competitive. He is also a very strong blitz chess player.